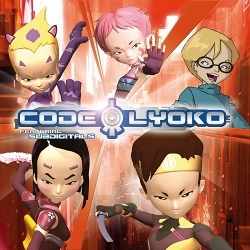 Discover the Code Lyoko CDs! From the original theme "A World Without Danger" to the Subdigitals album, dive into the musical universe of your favourite series! You want to listen to and download the music directly? Hm... OK! Contains 12 songs composed specially for the CD, aside from track 11 - Break Away (music from the closing credits + lyrics) and track 12 - A World Without Danger. Also contains a bonus 13th CD-ROM track: the Planet Net video clip. In addition to the content on the English CD, also contains a bonus OpenDisc track allowing access to official bonuses on the web (the web bonuses are no longer available). 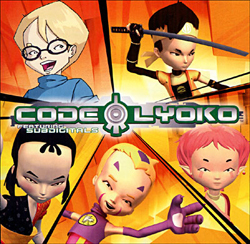 Contains the original version of A World Without Danger and its karaoke version. 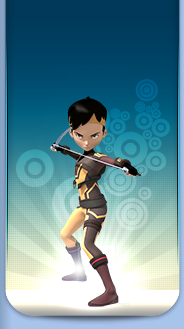 Limited edition contains a collector card. 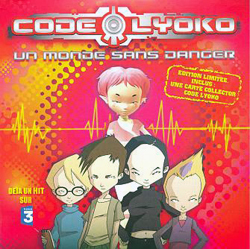 Reissue of the first single, containing the original version of A World Without Danger and its karaoke version. 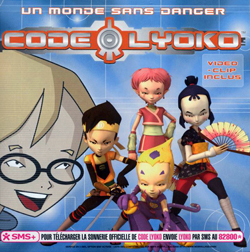 Bonus (CD-ROM track): Video clip of Un monde sans danger (FR). 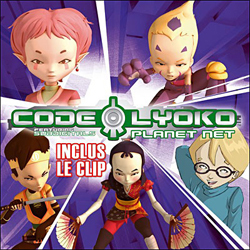 Contains the singles Planet Net and Break Away, as well as the Planet Net video clip (CD-ROM track).